Based on field experience conducted by TDH, achieving universal health coverage in low and middle income countries is possible. This requires bold steps by the international community and budgetary increases in national health budgets. Together we are working to achieve SDG 3 on Health, with a particular focus on SGD 3.1 which aims to reduce the global maternal mortality and SDG 3.2 on reducing preventable deaths of children under 5 years of age. The removal of financial barriers to accessing services, especially user fees. Sustained public funding for public health systems. Funding should come predominantly from general public revenues, international aid, and innovative financing mechanisms. Investing in quality of care. This means investing in each element of the health system: health workers, primary and secondary care facilities, information systems, and drug supply chains, especially for affordable generic medicines. This also means ensuring accountability for measurable improvement in health outcomes, including through civil society participation in policy development and oversight of service delivery. We strive to make sure every child enjoys the right to access healthcare and receive treatment whenever they need it. We work to improve health services within countries by providing ways to prevent medical issues, improving the treatment available and raising awareness through health education. For some children who suffer serious illnesses or diseases which cannot be treated where they live, Terre des Hommes organises for them to travel to Spain and receive treatment through the ‘Viaje hacia la Vida’ programme. Through a strong network of hospitals, doctors and volunteers, the child is treated in Spain before returning home. To read more about the project see here (Spanish). Terre des Hommes has successfully pioneered innovative, technological solutions to improve healthcare in countries within the Global South. 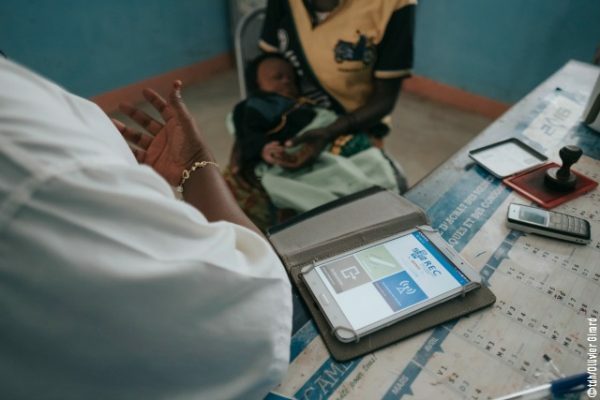 The introduction of electronic tablets in remote health centres in Burkina Faso has helped save children’s lives by improving the diagnoses of childhood illnesses. In Burkina Faso, one in ten children die before reaching the age of five due to a lack of qualified medical staff. To find out more about the IeDa project using e-Health, visit the dedicated website. These deaths are avoidable if diagnosed and treated properly – something Terre des Hommes’ project helps medical staff do. The project uses an app on each tablet to assist nurses during medical consultations. For years Terre des Hommes has advocated and campaigned for the Burkina Faso government to provide free healthcare for pregnant women and children under five, finally the legislation was signed in spring of 2016.